This is the original site of Hartsville Graded School (later Butler High School), the first public school for black children in the area, which opened around 1900. After the school moved to a new building on 6th Street in 1921, Rev. T J. James began using the building here for a Sunday school and later a long-running nursery school. Pride Park, established in 1986 when Rev. 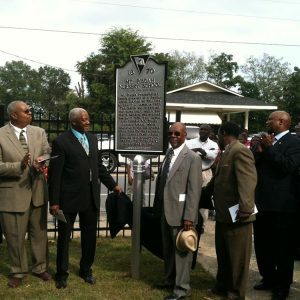 James’s family donated the site to the City of Hartsville, features a picnic shelter, a playground, restrooms, and an outdoor stage for events such as the annual Gospel in the Park series.